the world’s most environmentally friendly barrier mat. Designed from the outset to have a light environmental footprint helping protect the world WE live in. Engineered to keep dirty footprints out of the home YOU live in. At we believe in fair and ethical trading therefore we make sure that all of the cotton and materials that go into making our mats are from approved sources. From the outset the range has been created and developed to be as environmentally friendly as possible. From the sourcing of raw materials, the development of entirely new manufacturing processes, using cleaner/greener sources of electricity made by hydro pumps, windmill farms and solar, through to its eventual disposal and recycling – everything has been considered to ensure has a light environmental footprint, it can even be washed at 86°F. 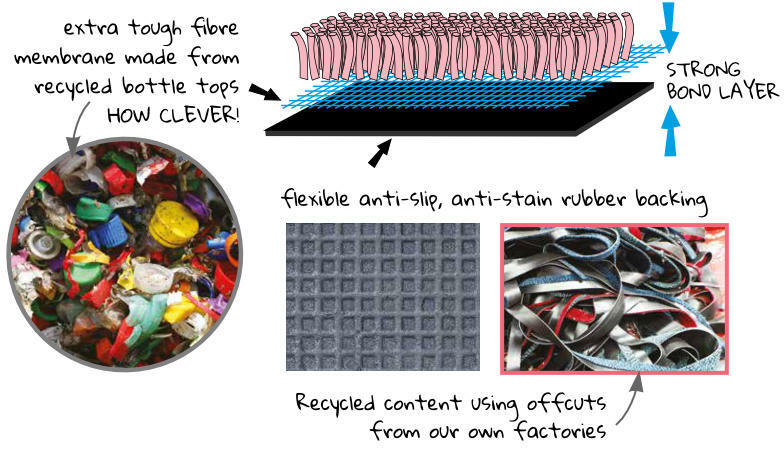 is manufactured using recycled cotton which is then combined with a new advanced microfibre, which is thinner than a human hair, this microfibre is extremely clever and is able to attract dirt and dust molecules very efficiently, in fact they can absorb over 4 times their own weight in water or liquid without letting any water through onto the floor! This means that not only will it clean better, but the rug itself will have a smaller environmental footprint due to the reduced amount of water required to launder it. Microfibre is a hypoallergenic material that is easily cleaned between uses – so eliminating the possibility of bringing external allergens into your home. *Simplicity itself to clean and washes at 86°F. Another environmental benefit is the increased life of a microfibre rug when compared to a standard cotton rug; longer life means less resources used to create new rugs! 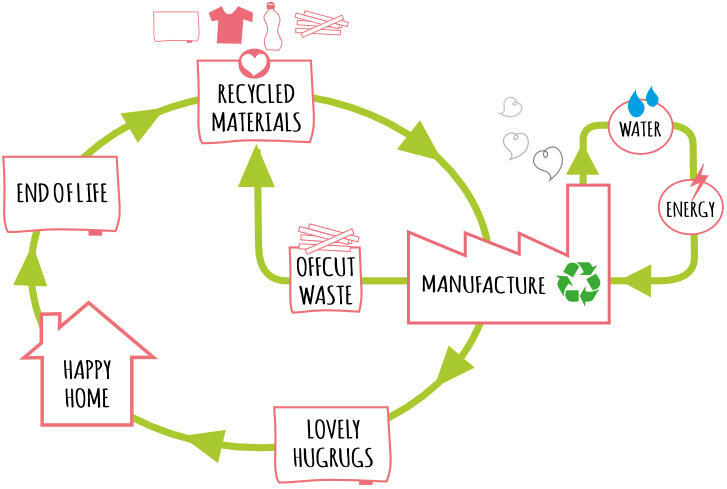 RECYCLED CONTENT: At HugRug we have always looked for the best way of creating a cradle to cradle ethos, as part of that we have invested in technology that allows us to recycle our own offcuts, trimmings and even old HugRugs, and use them in the rubber backing therefore saving anything going to landfill and creating a true virtuous circle! Ours mats are designed not to leave marks, however a combination of cleaning products, sunlight & heat may effect and / or cause discolouration to certain types of flooring when covered. We would advise you to please lift the mat frequently to allow the floor under the mat to be cleaned and aired. Our backing is a natural based product free from vinyl & PVC. For specialist flooring please check with the manufacturer before using any rubber backed mats.